Bangkok is a captivating city with world class street food, bustling markets and restaurants. If you want to taste it all and immerse yourself in a local neighborhood, there is no better place than Bang Rak. Bang Rak, is one of Bangkok’s districts known by locals for having some of the best food in a small area. Coincidently, Bang Rak is also known as the Village of Love, a popular area for local Thai’s to get married. Besides, the Village of Love also represents Muslim, Buddhist and Christian communities living in harmony for over 150 years. 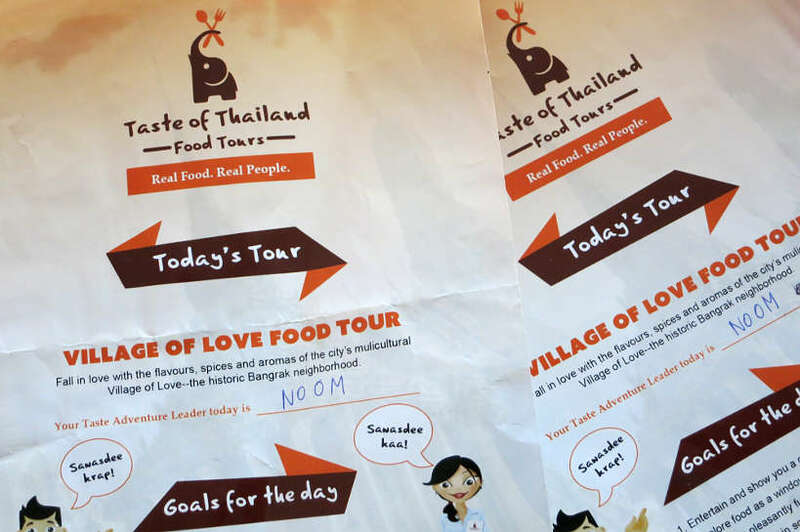 When we learned that Taste of Thailand offers a Bangkok food tour in the Village of Love, we were hooked! The opportunity to get an immersive cultural tour through food was a perfect match. So, put on your walking shoes and join us on a Taste of Thailand Bangkok food tour. Come with an open appetite! Our journey on this Bangkok food tour started by taking the BTS to get to the meeting point outside the Saphan Taksin BTS station. Riding the BTS or Bangkok Skytrain is a nice and convenient way to go around the city like a local. A little before 10am we met with Noom, our guide for the day, who handed us out our food tour map. We had been pre-warned to arrive hungry and once we looked at the 12 stops on the map, we were glad we did! Wherever there is people, there is food. This cannot be more true for Bangkok. As soon as we exited the BTS station, we started our Bangkok food tour with our first food stop. From a food cart near the train station, we tasted a typical Thai breakfast eaten on the go: pork on a stick with sticky rice. The pork was grilled on short skewers. The taste was a bit sweet and the pork a little fatty. The sticky rice was wrapped in plastic and eaten like a cereal bar. After a bite of Thai breakfast, it was time to cool us off with a typical Thai drink. 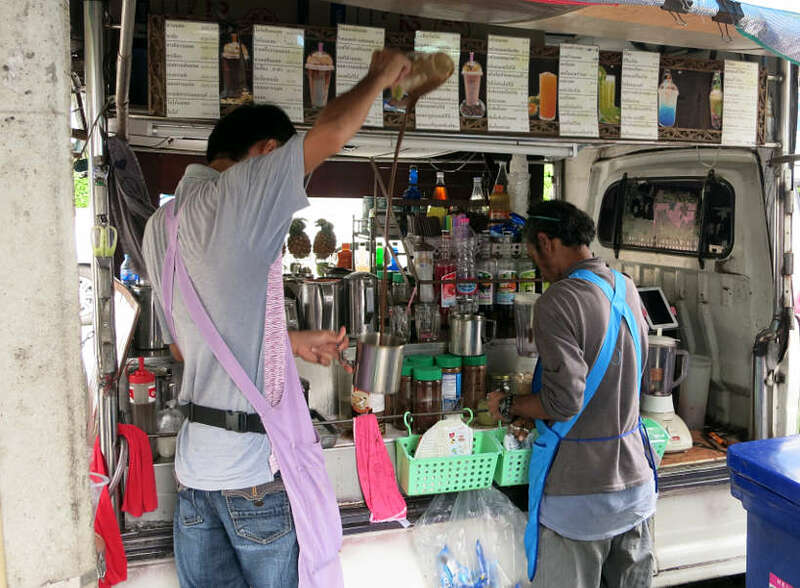 We stopped at a famous Tea & Coffee truck that serves Thai iced tea. Thai iced tea is made with condensed milk and natural orange coloring. Surprisingly, it is mixed and served by pouring the tea from high above the head back and forth. Thai iced tea tasted definitely on the sweet side though not overly sweet. It is a nice smooth drink to keep you cool in Bangkok heat. Iced tea high pour: the higher the pour, the smoother the tea! This immersive journey through Bang Rak, took us past Baan Oou Mosque, the first Mosque to register in Bangkok. We made our way to a nondescript, but well-known curry paste shop. Hand made every morning, the Thai pastes of different colors sell out to local vendors and restaurants by noon every day. 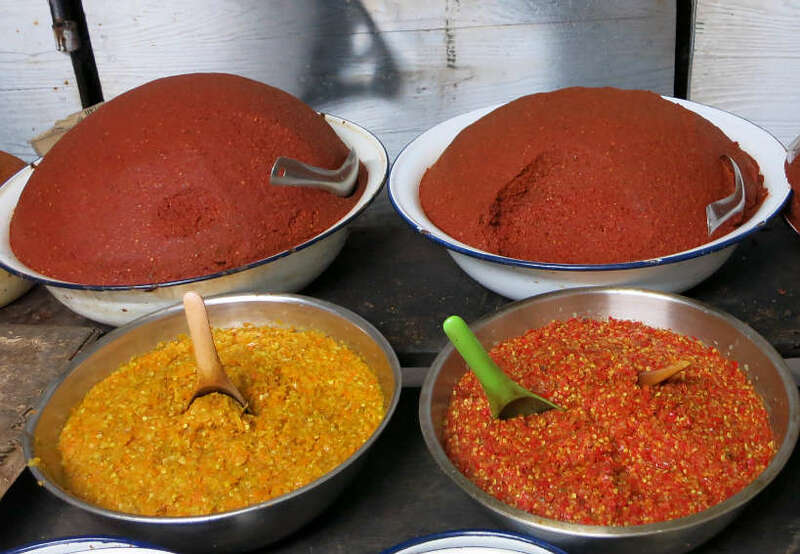 These pastes form the base of many Thai curries and dishes. Pungent, spicy, salty and briny we were impressed at the diversity of the pastes that form the delicious Thai foods we have come to enjoy. One of the things we enjoyed with the Bangkok food tour with Taste of Thailand, was the introduction to the unique flavors of Thailand. On the way to Bang Rak Wet market, we made a detour and stopped at a fish cake vendor. The idea here was to not only taste her reputable fish cakes but also to dip them in one of the sauces made with the paste we had just seen previously. We tried fish cakes made from fresh King Mackerel that were simply outstanding. Lightly fried with a touch with spice, we could have eaten a lot had we not planned for 12 food stops. Bang Rak Wet Market is Bangkok’s second oldest wet market. Small and dense, this market is packed with the usual suspects – fresh fish, meats, produce and meats, etc. 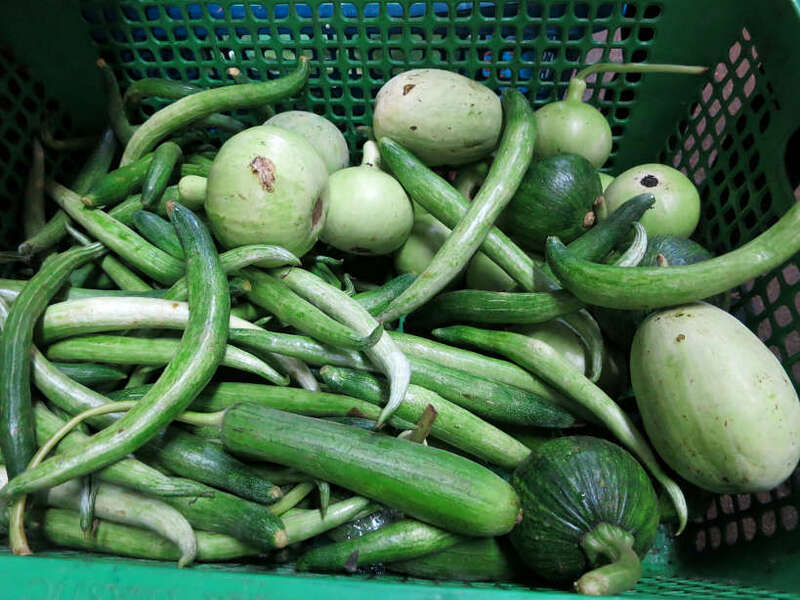 Amongst the fresh vegetables, we were fascinated by the number of egg plant varieties. We saw eggplants we had never seen before. Some, as small as peas, while others to medium golf ball sized. It seemed like every time we asked Noom, what something was, the response was “a type of eggplant.” Equally fascinating was seeing raw lemongrass and taking in it’s unique scents. As we walked out of the market, we continued our Bangkok food tour at Boonsap a bakery famous for its traditional desserts. We sampled a plate of five of their desserts including the signature sticky rice with custard. These tasty desserts were not very sweet, much to our surprise, and they hit the spot! 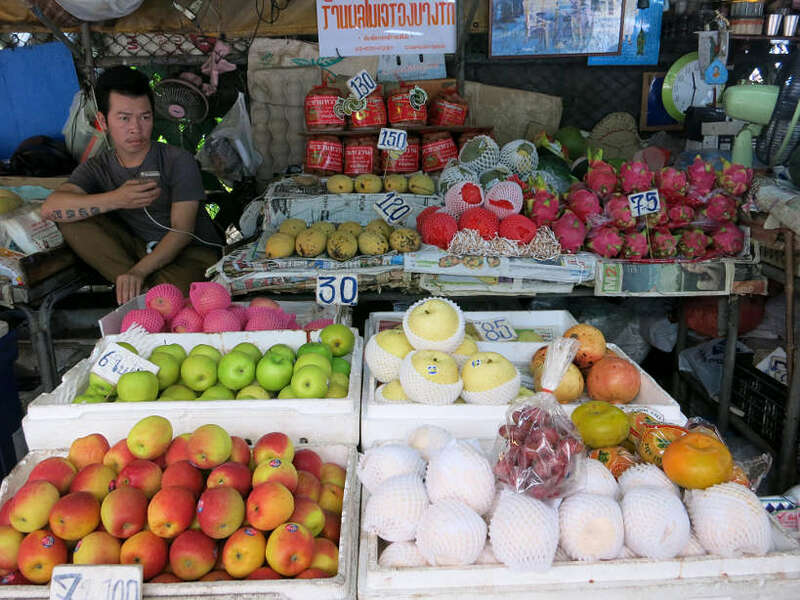 After walking down Charoen Krung Road, we stopped at a local fruit vendor to taste some of their products. We tasted fresh tamarind fruit, which is sweet and tart and surprisingly pasty in texture. 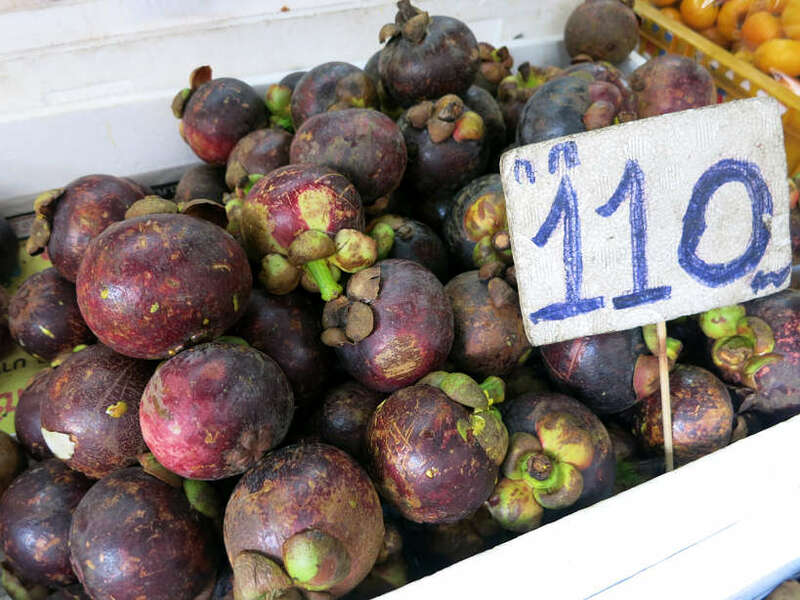 Mangosteen, one of our favorite fruits that we like for its refreshing taste and unusual shape and color. And finally, longan fruit which is another amazing fruit from the region, which tastes similar to lychee. In the multi-cultural Village of Love, we made a stop at one of the first Chinese grocers in the area. 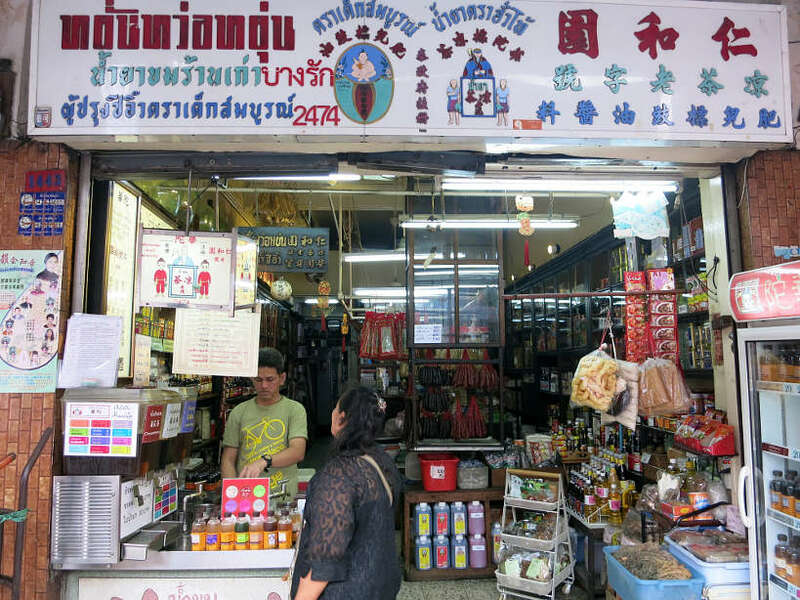 Wa Tow Chinese Grocer has herbs and medicinal drinks, which claim to cure a variety of things from weight loss, to detox, lack of energy and even a broken heart! Intrigued by the idea of weight-loss, we eagerly tried the popular Chinese bitter drink. The taste was so revolting and yes, bitter, it’s hard to imagine anyone suffering through this drink for the purported benefits. In addition to the herbs, the store also sells Chinese ingredients including sauces and soy sauces. We even spotted Chinese vodka, spirits and local Chinese beers. A great stop to explore local Chinese wonders and their influence on Thai culture. This was one of our favorite stops on the tour. We went to Prachak Petyang, a family owned shop with a reputation for their duck. Office workers on their lunch break filled the lower part of the restaurant. As we made our way upstairs , we couldn’t help but notice that every single table had the same dish on it – the roasted duck. The duck is stuffed with lemongrass and served with homemade egg noodles. The roasted duck delivered on all fronts. The skin was tasty and crispy and the lemon grass flavors deliciously seeped through the tender duck breast. Opened since 1909, you can taste and appreciate how this 5th generation family owned restaurant stays in business. One of the best things about taking a food tour is explore the history and culture through tastes and flavors. 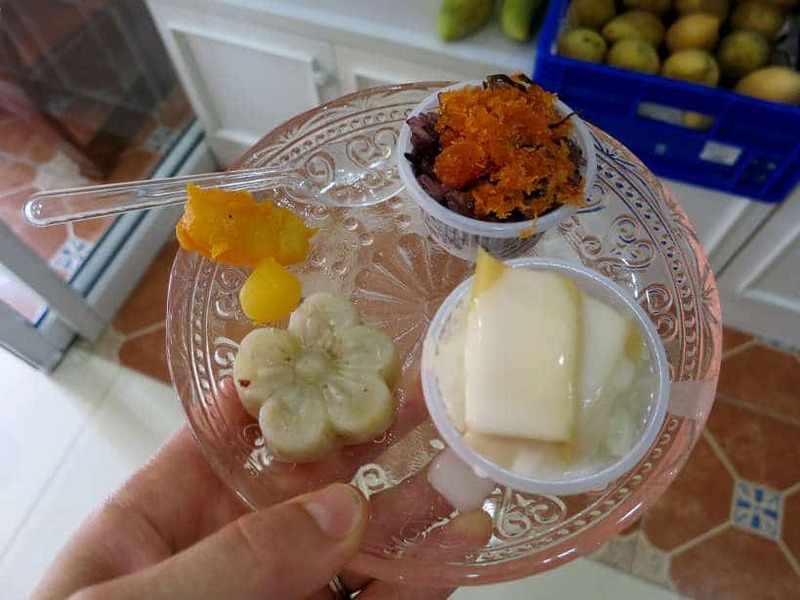 On this Bangkok food tour with the Taste of Thailand, we literally “walked” our way to the northeastern part of Thailand to discover the food from the region, called Isaan food. 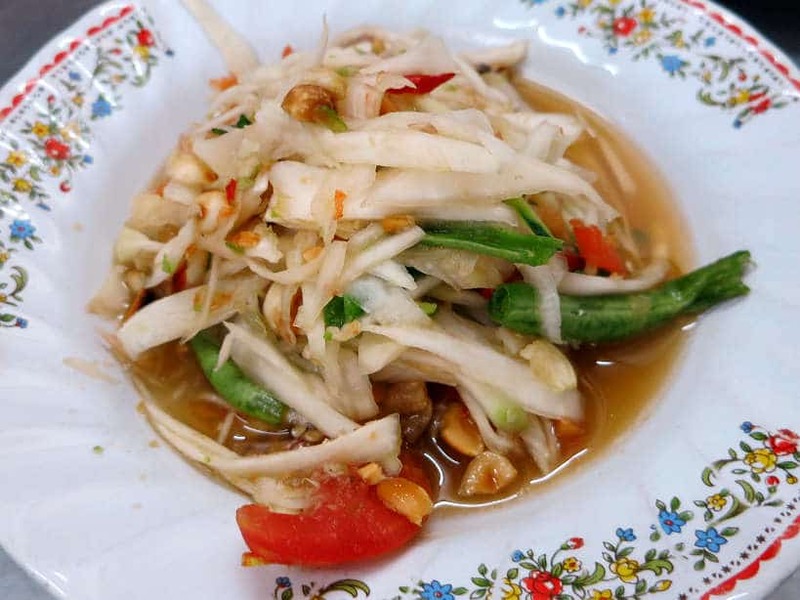 Isaan food is known to be spicy and with heavy influence from Laos. At the Jungle Food Two Sisters Shop restaurant in the Bang Rak area, we sampled two popular and iconic dishes. Som Tam or green papaya salad and lemongrass salad. The salads were served with the ever essential sticky or glutinous rice. 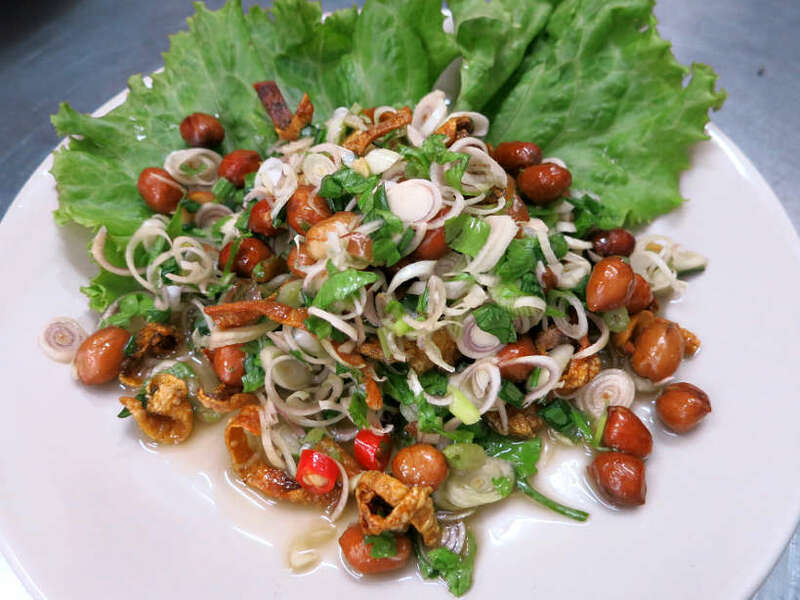 We loved the combination of flavors of the lemongrass salad. This one is definitely a highlight on our Bangkok food tour. The tour started with street food and ended at an upscale sit-down restaurant, fit for royalty. Than Ying restaurant serves genuine royal Thai cuisine. The restaurant was started by the sister of the former Queen Rambhai Barni, when she was the head chef of the Palace kitchen. The tradition of serving royal Thai cuisine continues under her son’s management. As we entered the restaurant, we were greeted by the front staff, who led us to our elegantly dressed table, with white table linens and napkins. Playing in the background, was relaxing French music. With all the eating we had done previously, the Taste of Thailand had wisely ordered just two dishes to finish off the tour. 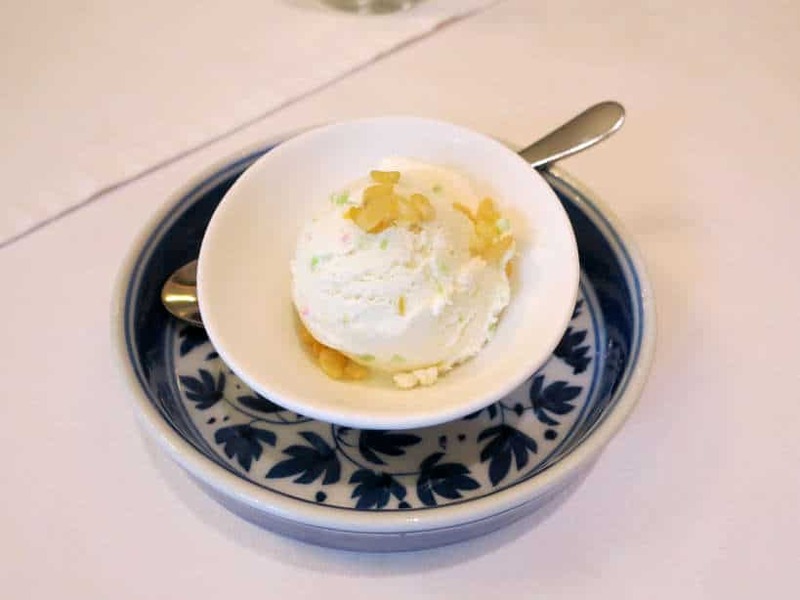 Thai Green Curry (Gang Kiew Hwaan Gai) served with rice and a delightfully refreshing coconut ice cream dessert. Rosemary could get not enough of the Thai Green Curry. 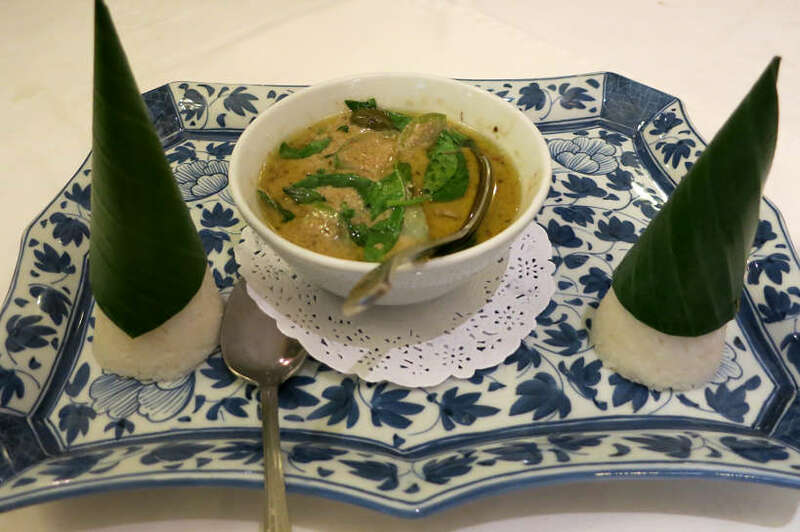 The eggplants soaked in green curry and perfectly paired with the chicken, was outstanding. The fragrant and aromatic flavors of the sweet basil was the perfect accompaniment to the rice. Even though I am not a huge ice cream fan, the coconut ice cream dessert made me a convert. Light and not sugary, this was the best way to end a fantastic Bangkok food tour with Taste of Thailand. Walking through the Village of Love in search for the best local food was delightful. 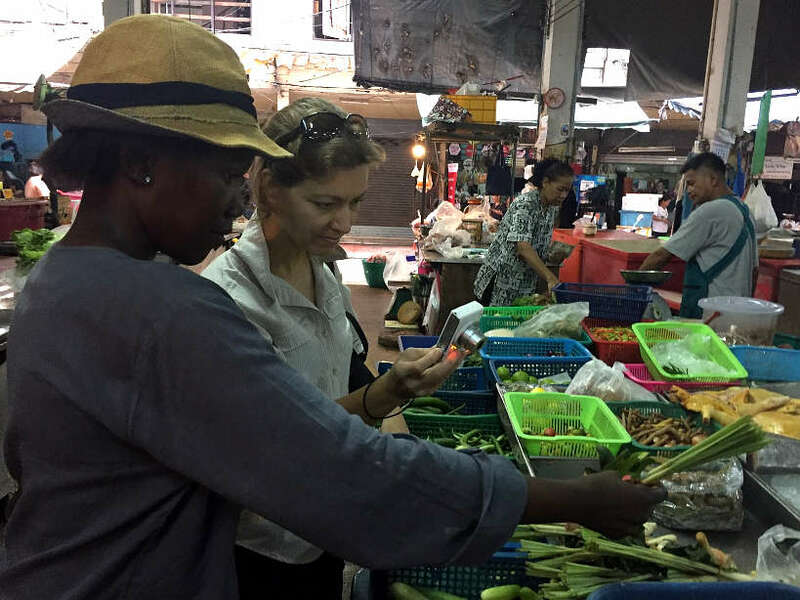 This Bangkok food tour brought us wonderful real and authentic experience that we wouldn’t have discovered by ourselves. At each stop, we got to eat like a local. It was like stepping for a day into the life of a Thai living in Bang Rak. The best part was that our guide Noom, shared stories insights into the local Thai culture along our journey. He was attentive and answered any questions we had, not only about Thai food but Southeast Asia food in general. Taste of Thailand tours are conducted in small groups and on that day we happen to be the only ones on our tour. A nice and unique privilege! Although they were many stops, we got to enjoy each of them and we didn’t feel too overwhelmed with the food. 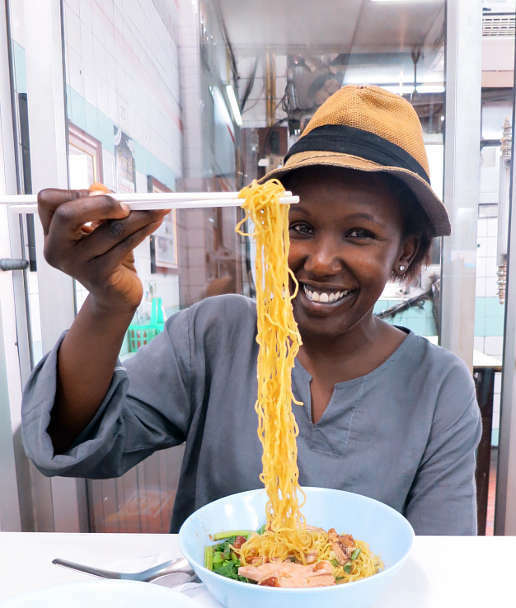 This Bangkok food tour reminded us that food is a great way to connect people and break down barriers. And we are tempted to believe that food is one of the reasons that the Village of Love is what it is today: diverse communities living peacefully together! Duration of the tour: Approximately 4 hours. Tours offered Monday to Saturday starting at 10:00 am until 2:00 pm. Cost: 1,300 THB (Thai Baht) – Approx $37 USD per person. Special thanks to Taste of Thailand for having us on this tour. All views and opinions expressed are our own. Full bellies and happy taste buds too. The food looks great and looks like you had a great time! Thanks Katie. Truly a fun and educational experience. If your travels take you to Thailand, do take the Taste of Thailand tour. Cheers. The noodle 🍜 dishes look awesome. What a treat to do a Bangkok food tour in the Village ! You are so right, you can’t go wrong with noodle dishes in Thailand 🙂 Thanks for your comments. This is such a memorable adventure. I have never tasted Thai food, but think I would like it. I love coconut ice cream. It is a simple hint of sweet. If you’ve never had Thai food, you are missing out. Go to a Thai restaurant near you and get a sample of the dishes. You will love it 🙂 Yes, the coconut ice cream was fresh and with no added sugar. A real delight. Thanks so much. A wonderful experience indeed. Yes, Thai Iced tea is quite good and indeed, better in Thailand. Thanks for stopping by. Reading this is making my mouth water, all this food looks delicious! So glad you enjoyed the article. 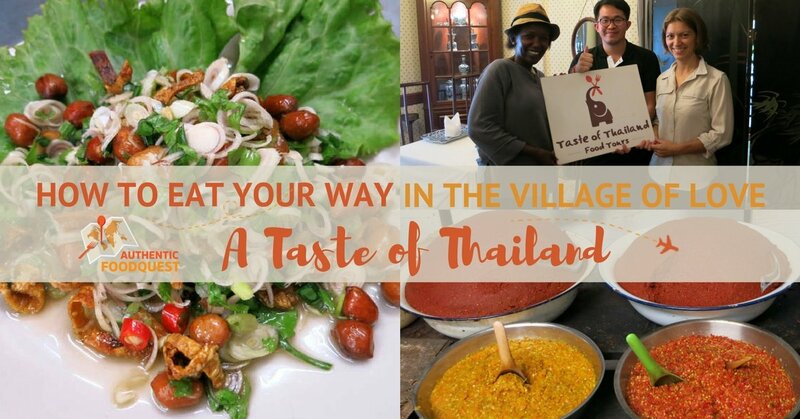 The Village of Love with the Taste of Thailand is indeed a culinary adventure. Ahhh… Thai Food! I seriously can’t get enough. Makes me want to immediately book a ticket back to Thailand! 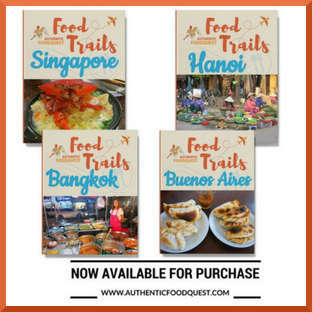 The Taste of Thailand food tour looks like it provided you with a thorough overview of delicious foods found around the country! I need some of that Thai Green Curry NOW!! I’ve just ordered Lebanese food and now I’m wishing I’d gone for Thai! Nothing can compare to the food you get in the streets in Thailand though. Mouth is watering now haha. Could not agree more, the street food in Thailand is amazing. 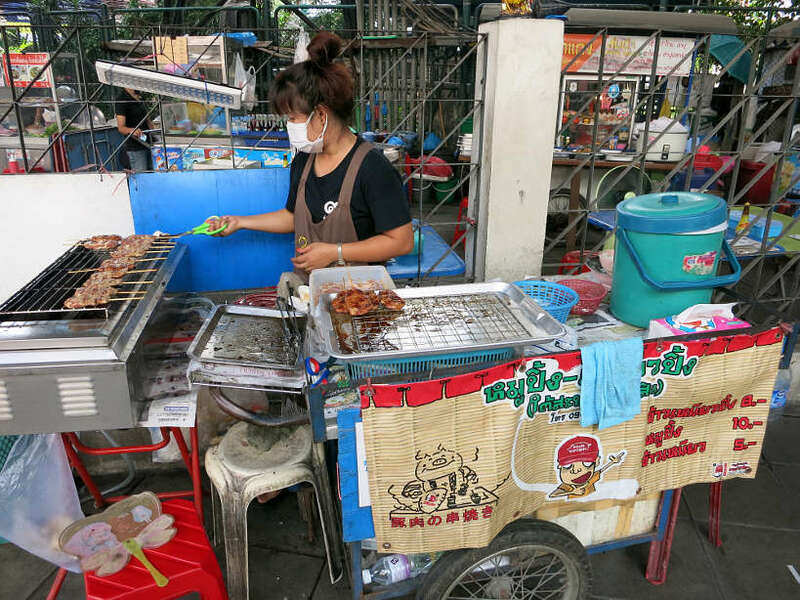 No wonder Bangkok is one of the top cities for street food! Thanks for your comments. 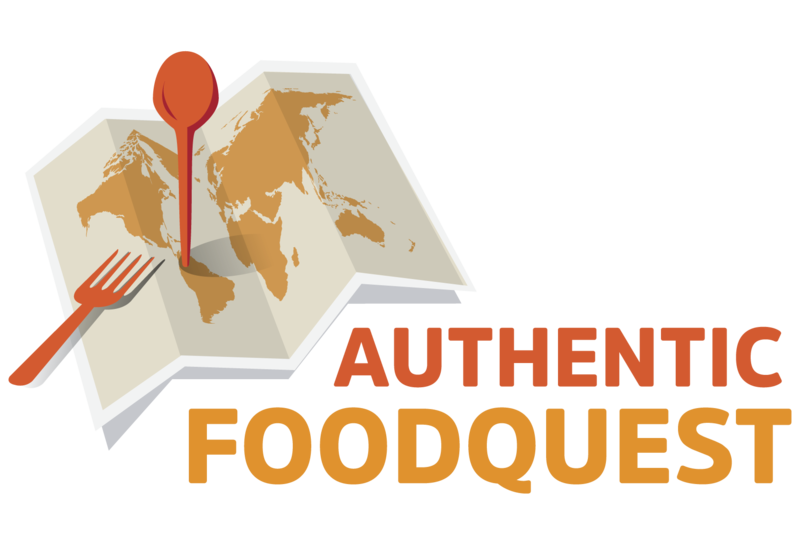 I would love to do this food tour! This would be a perfect opportunity for me to break away from my go-to Pad Thai (I love Pad Thai!) and try something different. The price point is very reasonable too considering the length of the tour and the amount of food you try. I imagine you’re not left hungry at the conclusion of the tour. Thanks Heather for your feedback. A tour with The Taste of Thailand will absolutely broaden your food options and you will discover other equally delicious options. Let us know if you have any questions as you prepare for your next trip to Bangkok. Thanks so much! I love Thai food, but have never been to Thailand. What a treat this must be! Everything looks so vibrant and wonderful! If you love Thai food, you will love it even more in Thailand. Hope your travels take you to Bangkok in the near future. A truly exceptional experience. Thanks for stopping by Patricia. So glad you enjoyed the article Amrita. Hope your travels take you to Bangkok soon so that you can enjoy the tasty delights. Cheers. What a great tour! Noom really did a great job taking you to such a variety of food places. What was you absolute highlight of the day? The desserts looked pretty amazing, and I would love to taste the curries and lemongrass salad. Wow, that’s a tough question…’what was the highlight of the day?’. The whole experience was exceptional. The food was the absolute highlight, though learning about the dishes and local context was invaluable for keeping things in perspective. Overall, it was well put together and Noom was a great guide!! Do check out the Taste of Thailand if your travels take you to Bangkok soon. Appreciate your comments, Ali. I was in Thailand over Christmas. The food is one of the best things about it in my opinion. 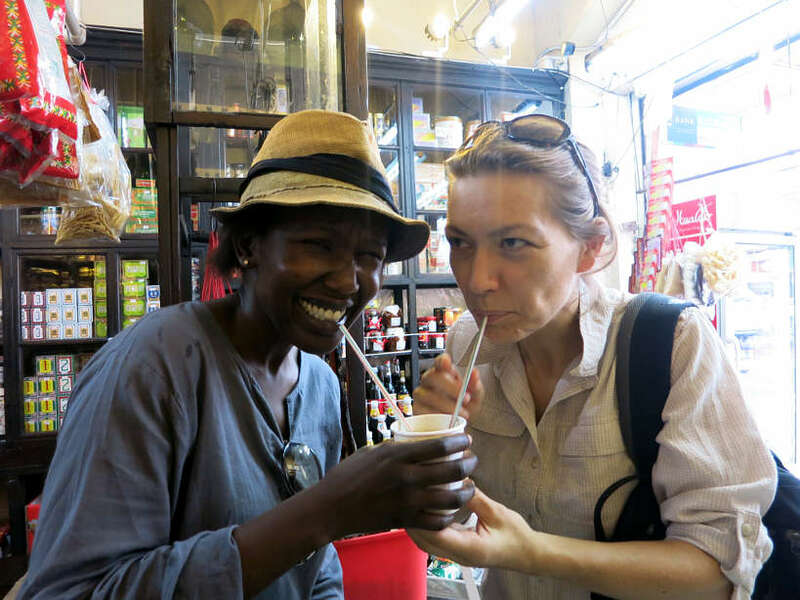 A food tour sounds like a great way to try things you otherwise wouldn’t. So glad you enjoyed reading the article. We agree, traveling through food gives a person a deeper and richer experience. Thanks for stopping by. The food in Thailand seems so tasty and delicious! I love the spices that they use! Thanks Sondra for your comments. Do you have any particular favorite Thai dishes? Cheers. What an incredible way to get a taste for the area. The tour sounds fantastic and by the looks of it really offers a wide range of flavours for all taste buds. Trying local foods and visiting markets is one of my favourite things about visiting a new city. It certainly sounds like this tour ticks all the boxes. This was truly a wonderful experience. Since you love tours and visiting markets already, feel free to check out The Taste of Thailand on your next trip to Thailand. Thanks for stopping by. Awesome. 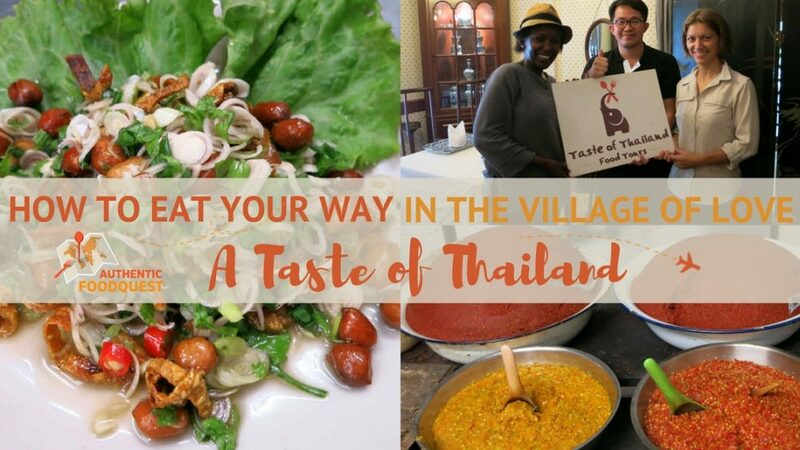 You will love eating your way around The Village of Love with Taste of Thailand. Let us know if you have any questions as you prepare for your trip. Cheers! I’ve been to Thailand quite often and I loved the food. I didn’t know they offered food tours but definitely if they did, its a must try. 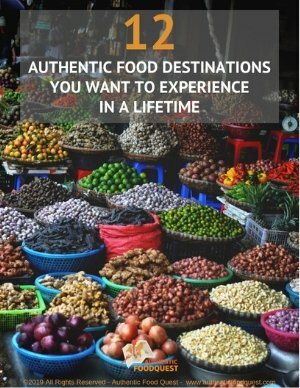 Yes, they do have food tours in Thailand. Look into it the next time you go to Thailand. It’s a much deeper experience with a local and knowledgeable guide. Thanks Karla. Thanks Sarah. That means alot. 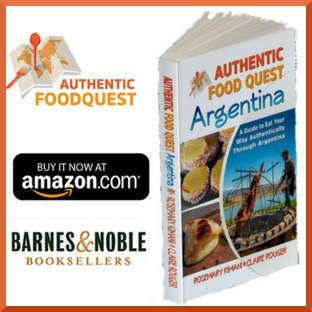 So glad you are enjoying our blog and the discoveries of the local and authentic specialties. Thai tea is quite delicious. 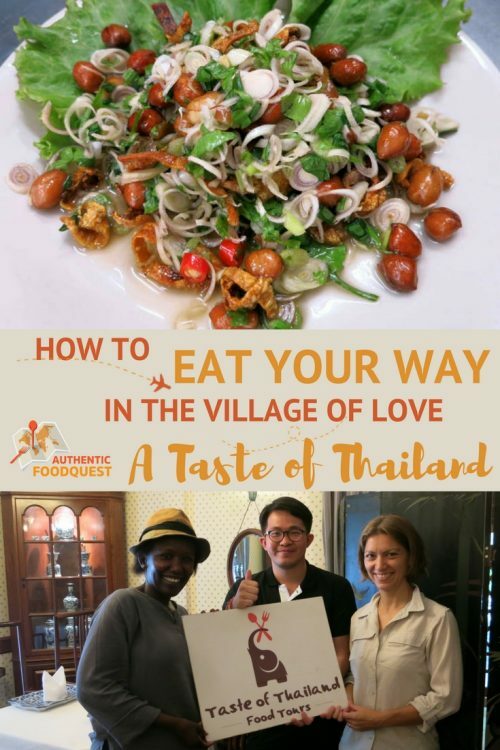 Be sure to eat your way through the Village of Love on your next trip to Bangkok. 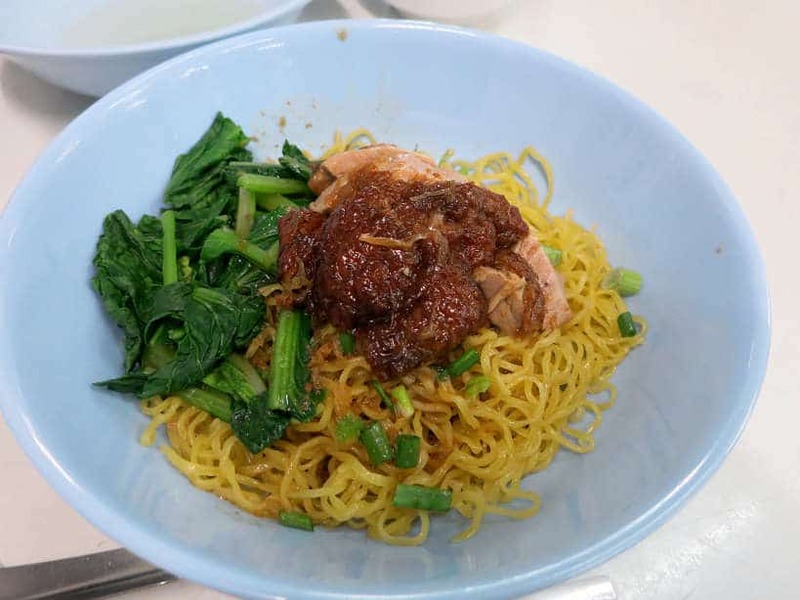 I’ll be travelling to Thailand this summer, so I’m already looking forward to all Thai food and reading this is making my mouth water in advance, especially the roasted duck with egg noodles looks delicious ! Thanks for posting. You are most welcome Marcel. Glad the article has given you some new ideas for your upcoming trip to Thailand. Feel free to reach out with any questions as you get ready. Cheers! Culinary experiences are among my favorites when traveling, so it was a pleasure to read this article. I will go in South East Asia for two months, not in Thailand, but looking at your pictures has made me want to plan a future trip to there, as well. Where in Southeast Asia will you be traveling to? We are currently on our Southeast Asia tour and have visited a few more countries than we have had a chance to write about. Feel free to reach out with any questions. You will absolutely love the food in Southeast Asia!! The roast duck with the egg noodles and the lemongrass salad look incredible! I’ve always loved lemongrass. I think the hardest part of street food vendors is knowing which ones are okay. Westerners can experience getting sick even when things are relatively clean just because we don’t have a tolerance built up to that kind of thing. You are right the roast duck with egg noodles was divine. Duck cooked with lemongrass does give it a delightful flavor..which of course comes out front and center in the lemongrass salad 🙂 As far as street vendors go, there are a few tips to keep in mind to ensure safety. 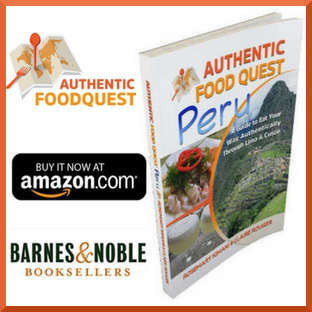 Eating where there are many locals eating and choosing “hot” and “cooked” items does help. As westerners, we’ve actually not gotten sick from eating on the street. It’s more about being safe rather that what the western stomach can tolerate or not. Thanks Jennnifer for stopping by. 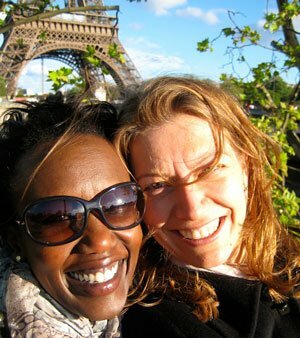 That’s wonderful that you are taking a tour of the Village of Love. You will have a delicious time. Please make sure to come back and let us know about your experience. Happy travels!